Will (and Can) Windows 7 Come In Many Flavors? As both WinHEC and PDC 2008 move ever closer, talk among Microsofties has increasingly turned to Windows 7. Specifically, talk among bloggers has begun to focus on whether Microsoft will continue what it began with Vista by segmenting Windows into (arguably too many) various editions. Let’s look at Vista as is stands now. Five seperate editions round out the line — Home Basic, Home Premium, Business, Ultimate, and Enterprise. A sixth, Windows Vista Starter, is aimed at developing markets. 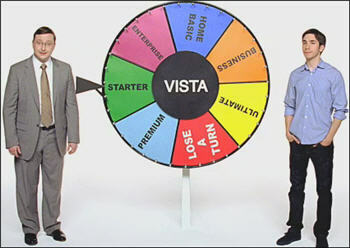 The launch of Vista changed Microsoft’s previous policy of having a single operating system for consumers, expanding it to three seperate editions. Microsoft’s decision became instant fodder for Apple, which used the somewhat confusing offering in its highly popular Mac vs. PC ads. Was this a wise move? Probably not. If you picked the Basic version, you basically got a reskinned version of XP with security enhancements. In order to get the “full” Vista experience, the Premium edition was necessary. Microsoft’s own chart clearly shows how hobbled Basic is when compared to the other editions. Now with Windows 7 around the corner, there seems to be some movement among Windows watchers to suggest that Microsoft return the the one version apiece strategy for consumer and enterprise customers. Apple has used this successfully for years, and at $129 per upgrade, it is fond of mentioning its “Ultimate” version is more than half the price of Microsoft’s. This response doesn’t make sense for a number of reasons. First off, the base version of Windows Vista is no cheaper than Windows XP Home, and really offered nothing other than a redressing and bug and security fixes as I have pointed out earlier. Second off, the biggest thing about operating system upgrades is new functionality. Basic really offers none. One could argue that Microsoft forcing people to pay $30 or more over what they paid for their XP upgrades for true enhancements is what kept people away from Vista, above and beyond the bugs and glitches. The same mistake shouldn’t be made twice. Another point to ponder: Windows 7 will release (late 2009) in the midst of what many are fearing will be a deep recession, and I can’t see Microsoft keeping the current strategy. People aren’t going to pay $250 for an upgrade when they have other things to worry about. Let’s get back to the $99 for the consumer, and $199 for enterprise upgrade price structure. Come to think of it, I haven’t heard anybody talking about the recession in terms of Windows 7’s release. That’s something that has to have Microsoft a little bit worried, don’t you think? Well, I’ve worked with the pre beta and am impressed with the speed it boots and greater usability. I have Vista business on a HP Pavilion tx1000 notebook which bogs it down bigtime – I’ll pay to upgrade it to 7 Business just to get rid of Vista. I roll my own desktops so the price matters to me, but the way it looks so far I’d seriously consider investing at the asking price. It looks like an OS worth paying for and one that will will be around a while like XP. It will be interesting to see if MS cuts prices at all in response to the hard times. Will they do it? Nah.